Being well known for their cute gaming pieces used in Shear Panic and Hameln, the Lamont brothers were faced with a problem at the production stage of Antler Island when prices for their cute Stag playing pieces went up so high that they had to increase the edition-size of their game to 2500 pieces. Revealing this fact openly and giving all people who had placed a pre-order a chance to withdraw this order, they still came to the SPIEL 07 with a good rate of over 700 games still on reservation for being picked up here at Essen. Already upon opening the gamebox I could discover that this game is much different than Hameln last year, since the gameboard for Antler Island was not made on a computer but actually drawn by a professional artist. The gameboard shows and island with a raised inner region, and the inner region in turn is crowned with an additionally rised peak. 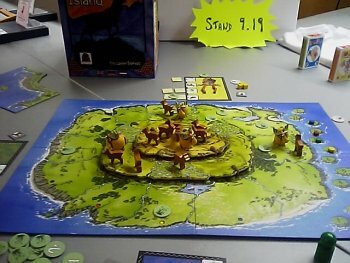 At the beginning of the game, each player puts his Stag playing piece at a colour coded space on the island's outer region, while some Does and Food tokens are evenly distributed amongst the other spaces of the island. The only exception are three swampland spaces on the middle region and the peak space at the center which are left empty of Food and Does. During a round of the game, the players first have to plot the four actions which they want to perform during the round. To plan their actions, the players have five markers bearing the numbers from "1" to "3", an "X" and an empty marker which they may secretly assign to any of the four possible types of action listed on their player sheets. The possible types of action are the movement of he player's Stag by one space, the eating of the food tokens from a currently occupied space, the mating with a Doe on the same space or the growing of Antlers. However, the players doe not act simultaneously, but instead they start with the starting player who first has to reveal his "1" marker in order to perform the action he has assigned the marker to. Then the other players reveal their "1" markers in turn, also performing the actions they have chosen with their markers. The empty marker may be used for bluffing, although it is considered to be bad sportsmanship to look at another player's placement of markers before placing his own markers. The "X" marker on the other hand is some sort of a joker, and a player always may chose to reveal his "X" marker instead of one of his numbered markers to perform the action he had associated with the "X" marker. Afterwards, the player who has used his "X" marker resumes revealing his numbered markers as normal. As might be guessed, eating, mating and growing Antlers all are subject to some kind of special rules. As for moving, the players may move their Stags for one space with the exception that the are not allowed to enter the three swampland spaces. For eating, a Stag must be in a space with one or more Food tiles, and the eating-action allows the player to pick up available Food tiles as long as the maximum possession limit of 5 Food tiles is not exceeded. Likewise, a Stag must be in a space with at least one Doe to perform the mating-action. One Doe figure then is removed from the space and returned to the common stockpile, whereas the player may add one to his Doe-marker at the side of the gameboard. Finally, the player may cash-in a number of Food tokens. The value of these tokens is added and the divided by two, and the resulting number is the number of Antlers which the Stag may gow. Whenever a Stag has reached an even number of Antlers, the player also receives one special action counter. Depending on the type of the counter, the player may use such a counter during his turn for a specific action. So, it may be possible that the Stag may be moved for an additional space, an extra Food token might be taken, an additional mating action, the retaining of a Food token or an Antler piece in combat, or the roaring call to a Doe on an adjacent space. Between the players' rounds, all Does remaining on the gameboard move one space upwards straight towards the island's peak where they are going to wait. Also, a colour-coded dice is rolles twice, and by this process the places for the distribution of new Food tokens and the entry spaces for new Does are determined. The game comes to its end when the first player reaches a certain number of matings which are documented on the Doe-marker, and then the victory points are distributed. So, one point is given for each mating, three points for occupying the peak space on the gameboard on the final turn, or one point for being in the middle region. However, a Stag who never has won a fight with another Stag could not rightful claim the title of being the 'Monarch of Antler Island', and thus a player needs to fight with other player's Stags if he wants to win the game. Combat between two Stags on the same space is unavoidable is neither player volunteers to withdraw his Stag from the space, and thus both player's count the number of their Stag's Antlers and the first the attacker and then the defender secretly commit one to three food tokens two be added to the combat value of the Antlers (representing the Stags' fighting condition). Once again, both players may decided to withdraw, but if this doesn't happen it comes to a locking of Antlers in which both players reveal the food tokens they have used to back their stag in combat. The question how will win the combat is determined by adding the value of the Food tokens to the number of Antler pieces. Whether by combat or on a player's own decision, in the end one stag will have to withdraw from the space, and the remaining player also will be allowed to take a special action counter for being victorious. This actually lines out all rules needed to play Antler Island, and although there are some few more twists which I chose not to include within the short review, you will quickly discover that the new game of the Lamont brothers is much easier to learn and play than the somewhat more difficult Hameln. However, although there are detailed rules for Stags fighting each other, in some games player interaction in Antler Island may remain on a rather low level. Depending on the strategy followed by each player, the island is big enough for a Stag to remain on the outer edge of the board and take the food and Does available there. Thus, a longer part of the game may pass with the players rising their Doe marker very close towards the end of the game, and only in the endgame a few well-placed attacks of a well-kept Stag may possibly turn out to be decisive. However, this partial stasis only lasts until the players discover how decisive it is to occupy the position at the Island's peak space. This is the space where all the Does are moving, and occupying this position gives a player a quite advantageous position. And and early move for this position definately results in more competition on the gameboard. What I really liked is the way the players were required to plan their next four actions in advance, committing them to do certain actions but leaving some last possibilities for a timely reaction by the inclusion of the "x"-counter. In a way, this somehow strengthened the feeling of a stag running around on the island, since even the best cared animal sometimes may make show strange behaviour if confronted with an unforeseen situation. What is more, I think that the great artwork of the board, the unique presentation of a stag's Antlers and the usual marvellous playing pieces all contribute the a generally favourable picture, and thus I think that the game can best be recommended as a family game for three or four players.